I love this photo from the weekend. I never used to much. I didn't understand that in order to know joy, you had to understand sorrow and I braced and steeled myself against that. Then we had a baby with funky kidneys and then we lost a baby and other life *stuff* with people I love much and then Sean's been not well for a few years and now... now I can laugh. I wipe tears easily as they flow - but how I can laugh! A precious girlfriend told me I glow. 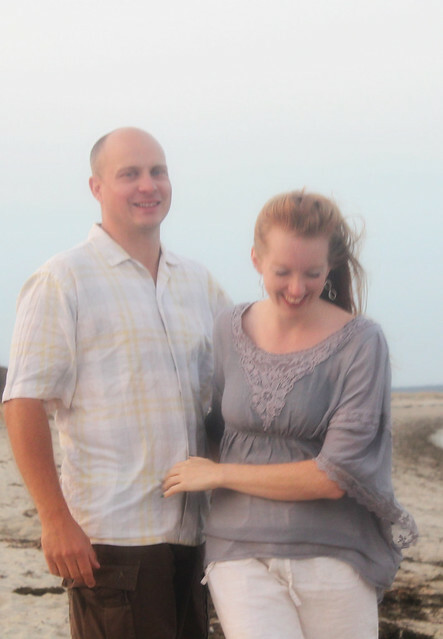 Tears rolled down my cheeks tonight as Sean and I looked through the family photos we took on the beach with a timer and tripod over the weekend and six vibrant personalities shine through in them - oh, how I laughed! And I praise God for the wonder of *feeling* things so easily, sorrow and joy, and knowing they are gifts, crazy as that might all seem. What a beautiful photo and post. p.s. I have been meaning to email you and will try to this week.. I never realized before how much I held life at a distance because I was so afraid of feeling. I lived always waiting for the other shoe to drop, but praise God that he healed me and offers me the freedom to live unafraid. Now I know the joy of living (with all the emotions) and I know what it means when the bible says.. "her children arise and called her blessed (happy)". The joy of the Lord is written all over my face. first I need to tell you, that I love your writing style. Of course it's not so easy for me to express what I think in (my only-learned-in-school-)English, but I hope, you will understand ;-). Mostly when I read your posts I think that you are so right, I know exactly, how you feel - In many things I feel so very similar. This is one of those posts. And it reminds me of a song we have sung last sunday in church, that tells, that laughing and crying shall be blessed. And this is so right, and I really think people who are able to have real and deep feelings, good and bad, are blessed. Life does not only have a bright side, we have to live with both sides, but we even don't need to give up and to stay at the darker side to long, like some people do. Laughter is healing, and life giving! Wow. I needed this. Thank you Hannah! What a beautiful post! I agree that being able to truly feel every emotion is a gracious gift from God. Thank you for sharing! It seems like tears are near the surface today. I am tired, and that's the natural progression after several months of nursing a new baby nights. Alas, joy eludes me and I know it. I am thankful. I am grateful. I am content. But laughter doesn't come easily. I want to embrace joy! I want my children to no have to earn my smiles, my laughter, my joyful countenance. I realize that joy is born within, but I also see a need to practice some of those things that form habits (such as smiling when it isn't a natural response). Beautiful photo! Thank you for writing such a wonderful post.